Ozhotels is a group of independent and unrelated hotels, resorts and serviced apartments that are located in the popular holiday destination of Surfers Paradise on the Queensland Gold Coast. Ozhotels allows you to deal directly with these apartments and resorts, therefore giving you the best possible rates for this Surfers Paradise accommodation. 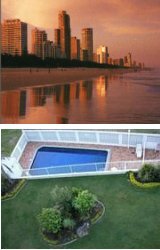 So book your next resort or apartment holiday accommodation in Surfers Paradise online and get value for money discount rates. The most popular holiday destination in Australia is indeed Surfers Paradise on the beautiful Gold Coast and it provides travellers from all over the world with so many different activities and attractions. The region includes a huge variety of places to stay, ranging from fully self contained holiday apartments and luxury resorts right through to affordable hotels and budget motels. The large range of accommodation in Surfers Paradise is what makes finding the perfect place for your holiday needs a difficult and time consuming task. This is why many people like to use the free services of an accommodation expert like OzHotels, which allows you to compare hundreds of different properties situated all over Surfers Paradise so that you can find the one that meets your travel budget. The main advantages of booking online with OzHotels is that you can book your travel up to 12 months in advance and that you will be able to get an extra discount off the already cheap rates the longer that you holiday in Surfers Paradise. 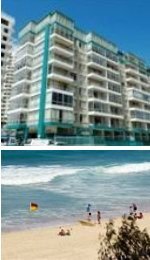 Surfers Beachside Holiday Apartments is ideally situated in the theme park capital of Australia, The Gold Coast's Surfers Paradise. This 4 star Surfers Paradise accommodation is perfectly situated less than 50 metres from the patrolled beaches and only a short stroll from shopping, restaurants and nightlife. 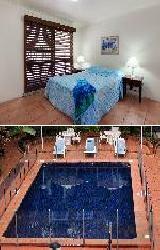 Surfers Beachside Holiday Apartments is in the ideal position to combine relaxations with pleasure. 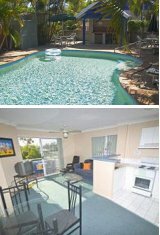 The Coolangatta and Brisbane airports are approximately 25 minutes and 60 minutes drive away from the Surfers Beach Side Apartments anf the fully patrolled surf beach boasts its own licensed surf club with restaurant, where you can relax with an afternoon cocktail on the decking overlook. 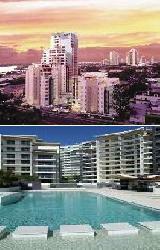 For more Surfers Paradise Apartments click here. 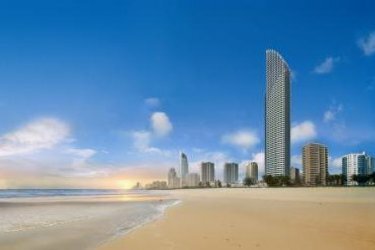 If you are looking for Surfers Paradise accommodation which is value for money all year round look no further than the Focus Apartments in Surfers Paradise on the Queensland Gold Coast. The location of this 4 star Gold Coast resort is perfect - right in the heart of Surfers Paradise and just across the road from beautiful kilometres of sand and a patrolled swimming beach. The Focus Apartments feature fully self-contained luxury 2 & 3 bedroom apartments set in large grounds with exceptional resort facilities including a swimming pool, spa, sauna, gymnasium, BBQ faciliteis, tennis court, basketball courts and children's play ground. If you are looking for one of the best and most luxurious Gold Coast hotels then you can't go passed the quality hotel rooms at the QT Gold Coast Hotel. This truly remarkable Surfers Paradise accommodation is ideally nestled in the very heart of Australia's favourite holiday destination and is located only 50 metres from the sparkling waters and white sandy beaches of the famous Surfers Paradise beach and only a few hundred metres to the cosmopolitan Cavill Avenue. This iconic 5 star Gold Coast hotel provides holiday makers with the ultimate in luxury accommodation in Surfers Paradise. The exceptional service, premium comforts and unique blend of space make the QT Gold Coast Hotel perfect for any family vacation, romantic weekend away or corporate conference. The stylish range of Gold Coast apartments have spacious, furnished balconies so that you can make the most of the fresh ocean breezes and take in the breathtaking views of the ocean, mountain and river. Guest can also take advantage of this Gold Coast hotels world-class resort facilities which include a gymnasium, spa and sauna, heated swimming pool and tennis courts. The Circle on Cavill is centrally located in the heart of Surfers Paradise and provides discerning holiday makers with a wide selection of luxury 2, 3 & 4 bedroom self contained spa apartments. 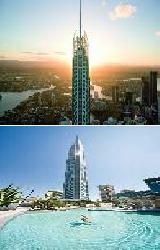 The Circle on Cavill Surfers Paradise represents a revolution in terms of luxurious resort accommodation and is located at the middle of the up-market Surfers Paradise retail precinct. The Circle on Cavill GCHR Surfers Paradise on the Gold Coast is close to everything that the region has to offer, as well as having a numerous guests facilities and services including direct internet access, free car parking, restaurant, sauna, spa, a landscaped garden area, 3 swimming pools including a lagoon style pool and heated lap pool, private theatrette, well equipped gymnasium, BBQ facilities and entertaining area, viewing terrace for the open-air big screen, security elevator and an intercom system. 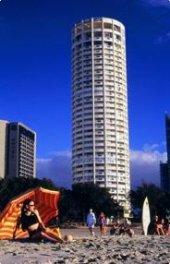 The Mantra Towers of Chevron is a Surfers Paradise icon and with luxury features, contemporary designs and a range of resort facilities typifies the very best in Surfers Paradise accommodation. ideally positioned in one of Gold Coast's most sought after locations the Chevron Towers Resort has something to suit the entire family. The patrolled beaches, restaurants, shopping and entertainment of Surfers Paradise are only minutes from the doorstep of these luxury Gold Coast apartments. There is a fabulous range of 2 & 3 bedroom fully self contained apartments complete with every luxury amenity required for a relaxing and memorable holiday. The Chevron Renaissance features manicured lawns, elaborate gardens, a massive pool and leisure area on level 5 of the resort, with pool, bridge, hot and cold spas, BBQ & entertainment areas, saunas, gymnasium, childrens playground, club lounge, games room, private theatre, secure parking and 24 hour security. Literally on the doorstep of this central accommodation in Surfers Paradise is the delights of the Chevron Renaissance shopping and dining precinct, with leisure and entertainment choices to satisfy your need for fun. 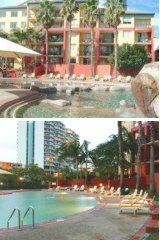 Q1 Resort & Spa Apartment Resort is an iconic apartments resort offering luxury 1, 2 & 3 bedroom self contained apartments with unparalleled resort facilites in a central Surfers Paradise beachside location. 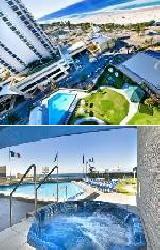 The Q1 Resort and Spa in Surfers Paradise is close to everything that the fabulous Gold Coast has to offer, as well as having a numerous guests facilities and services including lounge bar, business centre, conference centre, internet access, free car parking, gym, lift, restaurant, sauna, spa, outdoor swimming pool, tour desk, bbq, indoor pool, 24 hour reception, baby cots and babysitting service. 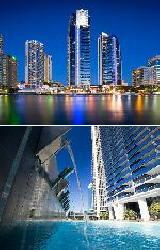 These unparalleled apartments are just metres from the wonders of Surfers Paradise, so welcome to the Worlds Tallest Residential Tower and a fabulous holiday on the magnificent Gold Coast. 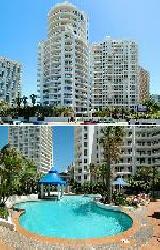 The 1 & 2 bedroom self contained serviced apartments that are available to families, couples and holiday makers at the Surfers Plaza Resort provide a budget place to stay that is close to all the action of Surfers Paradise, but far enough away to relax in the tranquility of its location. The property is onle a short walk from the shops, cafes and restaurants, as well as being just 400 metres from the famous Surfers Paradise Beach and 10 minute drive to Sea World. 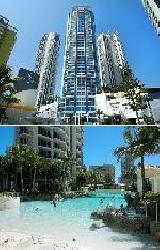 The Surfers Plaza Resort provides all types of travellers with discount accommodation in Surfers Paradise. It also features a wide range of modern amenities and services such as lounge bar, faxing facilities, free car parking, restaurant, sauna, spa, an indoor & outdoor swimming pool and bbq facilities for guest use. The Surfers Paradise Commerce Club is located next door provides a gaming bar with poker machine as well as family-friendly restaurants, barefoot bowling, Foxtel and great entertainment. 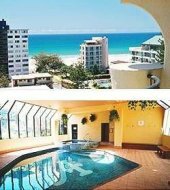 The Breakers North Absolute Beach Front Apartments Resort provides travellers with a selection of affordable 1, 2 & 3 bedroom self contained apartments resort located right on the magnifcent Gold Coast Beach. The Breakers North Absolute Beach Front Apartments Resort is a 15 storey hi-rise, superbly located within walking distance of restaurants, bars and shopping, only a 20-minute walk of the centre of Surfers Paradise and Broadbeach with the famous Jupiters Casino. 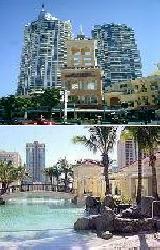 The Breakers North Absolute Beach Front provides all types of travellers with discount accommodation in Surfers Paradise. It also features a wide range of modern amenities and services such as business centre, guest laundry, lift, outdoor swimming pool, tennis court, tour desk, bbq facilities, free on-site secure undercover car parking, direct private access to fully patrolled beach, kiosk, bicycle rental, luggage storage, room service, dry cleaning service, car hire, vending machine for drinks, boogie board hire, tennis racquet and cot hire. The serviced apartments at the St Tropez Resort is set in a Mediterranean style holiday resort that is centrally positioned in the middle of Surfers Paradise, which is the heart and soul of the Queensland Gold Coast. 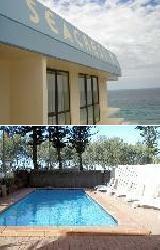 The St Tropez Resort, however is in a secluded spot just a short walk to all of the action. This makes it ideal for those looking for the social scene, a romantic getaway or an affordable family holiday. 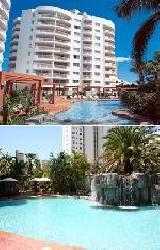 The St Tropez Resort provides all types of travellers with discount accommodation in Surfers Paradise. It also features a wide range of modern amenities and services such as free car parking, outdoor swimming pool, tour desk, bbq facilities with entertaining area, luggage storage, vending machines and baby cots available. The Australis Sovereign Apartment Hotel is luxury holiday accommodation resort with the scenic hinterland and premier golf courses close by. Also close by is the magnificent Surfers Paradise beach and the renowned Cavill Avenue with its fantastic array of shopping, restaurants, cafes and nightlife. The Australis Sovereign Apartment Hotel features non smoking hotel rooms and fully serviced one and two bedroom apartments. The recreational facilities include a lagoon style swimming pool with waterfall and children's wading pool, spa, sauna, games room, restaurant and bar, tour desk, BBQ facilities, FREE secure undercover car parking, 24 hour front desk, dry cleaning service, business centre, lift, luggage storage, 24 hour room service, guest laundry and WiFi internet. Located in the vibrant centre of Australia's renowned Gold Coast the Surf Parade Resort is in a perfect location for a relaxing and entertaining holiday. The superb studio and one bedroom holiday apartments at the Surf Parade Resort are ideal for couples and small families seeking top quality Gold Coast accommodation at discount prices. The Surf Parade Resort is a 10 level resort offering Mediterranean style apartments that have been tastefully decorated with quality fittings throughout. To make the most of this Surfers Paradise property guests can relax by the heated outdoor pool, spa and sauna, play a game of tennis, exercise in the gym and have a barbecue in the tropical gardens, gazebo setting. Perfectly positioned mid-way between Broadbeach and Surfers Paradise and only 200m from the magnificent, patrolled surf beaches this budget Surfers Paradise accommodation is an excellent place to holiday. The Broadbeach restaurant precinct are just a few minutes walk away and Jupiters Casino, Gold Coast Convention Centre and nightlife entertainment are all close by. The International Beach Resort Hotel & Apartments in Surfers Paradise offers budget hotel rooms as well as 1 & 2 bedroom self contained apartments fantastically located on the Esplanade in the heart of the tourist mecca of Surfers Paradise. The property has direct beach acces to the magnificent Pacific Ocean beach and also features a wide range of modern amenities and services such as direct internet access, faxing facilities, free car parking, guest laundry, lift, restaurant, sauna, secretarial services, spa, outdoor swimming pool, tennis court, tour desk, bbq, atm, security and baby cots available. With a wide range of activities to suit all guest needs, International Beach Resort offers quality, affordable hotel and apartment accommodation close to all major Gold Coast attractions, patrolled Surfers Paradise beaches and a range of local entertainment. 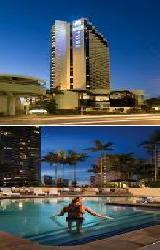 The Trilogy Surfers Paradise is one of the Gold Coast's best kept secrets. It is a trio of magnificent buildings set amongst native and tropical landscape gardens providing luxury apartments that are superbly furnished and spacious. 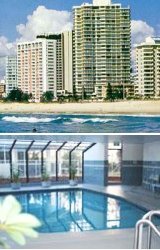 Some of the outstanding facilities at Trilogy Surfers Paradise Resort are the gymnasium, sauna, spa, games room, BBQ areas, heated resort swimming pool, free secure underground parking and monitored security. 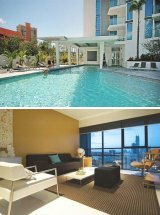 The Gold Coast accommodation provided by the Trilogy Surfers Paradise Resort consists of a choice of 1, 2 or 3 bedroom luxury apartments. Trilogy Apartments are just 5 minutes walk to the heart of Surfers Paradise, where you will find something to suit everyone including supermarkets, shopping, restaurants, cafes, nightclubs and themed attractions. Also an easy stroll from this luxury Surfers Paradise accommodation will take you to either the rolling surf of the famous Surfers Paradise beach or the tranquility of Budds Beach. The Gold Coast theme parks, golf courses and Hinterland are all within an easy drive from the Trilogy Surfers Paradise Apartment Resort. 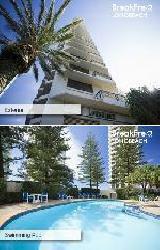 BreakFree Longbeach in Surfers Paradise offers a range of 1 & 2 bedroom self contained serviced apartments complete with ocean views. This apartment resort is perfectly situated only 50m from the magnificent Surfers Paradise beach, close to the Cavill Mall entertainment, dining & shopping precinct and in the heart of the Gold Coast. The BreakFree Longbeach is the perfect accommodation solution for an affordable Gold Coast getaway and features a wide range of modern amenities such as direct internet access, free car parking, fitness equipment, lift, sauna, spa, outdoor swimming pool, tennis court, tour desk, bbq, indoor pool and baby cots for hire. Guests can also take advantage of the tour booking service and book a trip to one of the Gold Coast theme parks. The Surfers Paradise accommodation at the Budds Beach Apartments is made up of one bedroom fully self contained furnished apartments, situated just 30 metres away from the picturesque Budds Beach and less than 400 metres from the famous Surfers Paradise beach. Budds Beach is at the northern end of Surfers Paradise and is less than 10 minutes walk to Cavill Avenue which is the heart and soul of Surfers Paradise. It features many of the Gold Coast's social activities including restaurants, cafes, night-clubs, tour bookings and shopping. 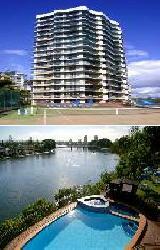 At the Budds Beach Apartments Surfers Paradise holiday makers will enjoy the quiet and relaxed ambience whilst also having easy access to the river which flows into the Gold Coast Broadwater only 30 metres away. Holiday makers and large families will enjoy all of the excitement that a Gold Coast holiday has to offer when they stay at the Surfers Tradewinds Apartments in Surfers Paradise. This discount Surfers Paradise accommodation is only a short walk from the city centre of Surfers Paradise and guests can relax in the tropical gardens around the swimming pool, heated spa and BBQ area at the Surfers Tradewinds Holiday Apartments. Guests can also choose from a wide selection of Gold Coast apartments including low rise one, two and three bedroom apartments each with it's own private sunny balcony. Situated close by to the Surfers Tradewinds Holiday Apartments is family entertainment and shopping at Pacific Fair, Oasis Shopping Centre and the new Gold Coast Convention and Exhibition Centre, the Broadbeach Mall with its trendy sidewalk cafes and restaurants, the monorail link to Jupiters Casino and a five minute drive to the Surfers Paradise racecourse, bowls, RSL and golf course. The Carlton Apartments are ideally located in the heart of Surfers Paradise and provide holiday makers to the Gold Coast with a wide selection of 1 & 2 bedroom self contained serviced apartments. Located right on Northcliff Terrace, across the road from the Surfers Paradise Beach and only moments from Q1 SkyPoint Observation Deck the Carlton Gold Coast Apartments provides all types of travellers with discount accommodation in Surfers Paradise. It also features a wide range of modern amenities and services such as direct internet access, faxing facilities, free car parking, lift, outdoor swimming pool, tour desk, luggage storage, weekly linen change, photocopying service, landscaped garden and even a babysitting service. 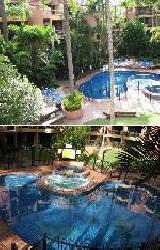 The Enderley Gardens Resort has a selection of fully self contained 1 and 2 bedroom apartments set in the only Rainforest Resort right in the heart of Surfers Paradise. Ideally positioned only 100m from one of Queensland's best patrolled beaches the Enderley Resort provides all types of travellers with budget Surfers Paradise resort rooms. It also features a wide range of modern amenities and services such as faxing facilities, free car parking, sauna, spa, outdoor swimming pool, tennis court, tour desk, bbq, garden, security and baby cots available. With world famous beaches and the serenity of the Hinterland rainforest nearby the Enderley Resort is the perfect place to stay on the Gold Coast. 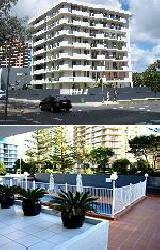 The Surfers International Apartments offers guest the choice of 1 & 2 bedroom self contained serviced apartments right in the heart of Surfers Paradise on the Gold Coast. This affordable holiday resort is positioned across the road from Cavill Avenue, the surf beach and the Centro Surfers Shopping Complex. Guests can enjoy Surfers Paradise accommodation with perfect sun drenched mornings overlooking crystal deep blue seas as they gaze at the Pacific Ocean from their private balcony. 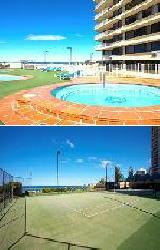 At the Surfers International Apartments there is a landscaped recreation area for a twilight BBQ beside the swimming pool, spa overlooking the beach, sauna, tour desk and gymnasium. This Surfers Paradise accommodation has professional staff to help you decide on your next exciting holiday activity or which Theme Park is best for you and your family. The Capricorn One Beachside Holiday Apartments Resort in Surfers Paradise offers modern 2 bedroom self contained serviced apartments, all with stunning ocean or river views, ideally located off Main Beach in the heart of the fabulous Gold Coast. Situated only a few fresh breaths away from the sparkling surf patrolled golden Main beach is this boutique budget holiday hi-rise resort is close to everything that Surfers Paradise has to offer. It also has numerous guests facilities and services including direct internet access, faxing facilities, free car parking, lift, sauna, spa, outdoor swimming pool, tennis court, tour desk, bbq, garden, airport shuttle, security and baby cots available. The Capricorn One Beachside Holiday Apartments in Surfers Paradise promises quality customer service & attractive self contained apartments that delivers on all your needs. 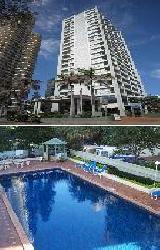 The Chevron Renaissance GCHG is the ideal place for an unforgettable luxury Gold Coast holiday. 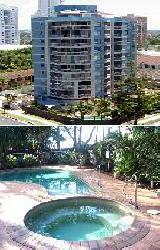 It is ideally positioned in the heart of Surfers Paradise and provides quality 2 & 3 bedroom self contained serviced apartments complete with breathtaking views over the Pacific Ocean, the Nerang River and Gold Coast hinterland. This Surfers Paradise accommodation is only a 2 minute walk to the fabulous golden sands of Surfers Paradise patrolled beach, Cavill Mall with all os it's fabulous shopping, dining and of course the entertainment that Surfers Paradise in renown for. The award winning Chevron Renaissance shopping precinct is literally on your doorstep, offering a select mix of cosmopolitan cafes, restaurants, fashion boutiques and specialty stores along palm lined boulevards. 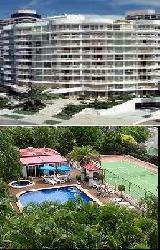 It is this unique combination combined with exceptional resort style facilities and services that makes the Towers of Chevron Renaissance Serviced Apartments popular with both families and couples from Australia and overseas. The Beachcomber Resort Surfers Paradise offers studio, 1 & 2 bedroom self contained serviced apartments perfectly located literally in the heart of Surfers Paradise, just 30 metres from the surf, sun and sand of the magnificent Surfers Paradise Beach. It also features a wide range of modern amenities and services such as child minding, direct internet access, free car parking, guest laundry, lift, sauna, outdoor swimming pool, tennis court, tour desk, bbq, baby cots available and babysitting service. Whether you choose to enjoy a cool drink by the pool or the excitement of the action-packed streets of Surfers Paradise, Beachcomber Surfers Paradise offers a whole lot of holiday options which are sure to please everyone. The Bahia Beachfront Apartments provides luxury 1, 2 & 3 bedroom self contained apartments located right on the oceanfront Esplanade of Surfers Paradise with fantastic views and direct beach access. The Bahia Beachfront Apartments are perfectly located opposite the magnificent, patrolled Surfers Paradise Beach and are close to everything that the city has to offer. They also have a range of guest facilities and services including direct internet access, free car parking, guest laundry, lift, sauna, spa, outdoor swimming pool, tour desk, bbq, garden, indoor pool, security, baby cots, babysitting service and daily housekeeping. For quality beachfront apartment accommodation with sensational views, affordable rates, great facilities and a central Surfers Paradise location, stay at the Bahia Beachfront Apartments. Seacrest Beachfront Holiday Resort offers quality 2 bedroom 2 bathroom self contained serviced apartments with breathtaking ocean views, centrally located on the iconic Surfers Paradise beachfront. The Seacrest Beachfront Holiday Apartments in Surfers Paradise provides the ultimate choice in budget holiday accommodation on the Gold Coast. 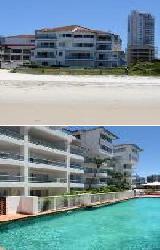 The Seacrest Beachfront Holiday Apartments provides all types of travellers with discount accommodation in Surfers Paradise and also features a wide range of modern amenities such as direct internet access, faxing facilities, free car parking, lift, outdoor swimming pool, tennis court, tour desk, bbq, garden, indoor pool, baby cots available and babysitting service. A visit to the Seacrest Beachfront Holiday Apartments is a must for all the car enthusiasts as this property is located on world renowned Super Carnivale V8's race track. You can also visit the Gold Coast Hinterland, which is truly priceless due to its amazing beauty with plenty of walking tracks leading through the fabulous rainforests, and some pretty towns which are worth visiting in the hinterland. The Ipanema Apartments on the Surfers Paradise provide stylish and affordable fully equipped holiday apartments complete with lavish amenities which will please even the most discerning travellers. These holiday apartments are perfectly located within walking distance to Surfers Paradise, Broadbeach, cafes, restaurants, Jupiter's Casino, Convention Centre and just a short stroll to the world famous Gold Coast beaches. Ipanema Holiday Resort Apartments is the perfect holiday destination offering a choice of fully self contained studio, 1 and 2 bedroom apartments that are well appointed with modern decor and featuring large private balconies woth ocean, city and hinterland views. There is also a licensed restaurant/cafe, heated and unheated swimming pools, children's pool, Roman bath, heated spa, sauna and steam room, fully equipped gym, BBQ facilities and entertaining area, tour desk, lift and FREE undercover car parking at the Ipanema Apartments. Ipanema Holiday Resort Apartments is situated close to alfresco dining, Jupiters casino, Pacific Fair shopping and the Gold Coast world reknowned theme parks. The Centrepoint Resort is the ideal Gold Coast holiday destination offering modern and stylish self contained apartments with fantastic resort facilities in the heart of Surfers Paradise. Ideally positioned just minutes from Gold Coast beaches, shopping and nightclubs Centrepoint Resort is the perfect Surfers Paradise accommodation for families, couples and friends. The fully self-contained 1 & 2 bedroom apartments feature stunning ocean or hinterland views, air-conditioning, fully equipped kitchen and laundry and wireless internet access. 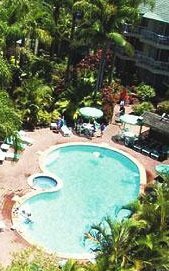 Set in an acre of lush tropical gardens, the Centrepoint Apartment Resort has everything that you need on holiday including outdoor swimming pools, an indoor pool, spa, sauna, tennis courts, BBQ area, games room with table tennis, pool table and arcade games, security system, tour desk and FREE car parking. The Gold Coast theme parks including Dreamworld, Warner Brothers Movieworld, Seaworld, Wet n Wild Waterpark and Currumbin Wildlife Sanctuary are just a short drive away from the Centrepoint Resort in Surfers Paradise. The Islander Resort Hotel Apartment is located in the heart of Surfers Paradise just one block from Cavill Avenue and within easy walking distance of the beautiful Surfers Paradise beach, cosmopolitan restaurants, shopping and nightlife. The Islander Hotel Apartment offers full resort style facilities including swimming pool, spa, stream room, tennis court, BBQ area and tropical garden setting. The discount rooms at the Islander Resort Hotel Gold Coast consists of either fully serviced hotel rooms or one bedroom apartments with full kitchen facilities. All of our Surfers Paradise accommodation rooms feature air-conditioning, private balconies and are literally a 1 minute walk to the world famous Surfers paradise beach. Our Gold Coast beach apartments are ideal for families, friends and couples wanting to stay close to the city centre and the beach at very reasonable discount rates. The Moroccan GCHR Apartment Resort offers all types of travellers luxury 3 bedroom self contained serviced apartments complete with ocean views. It is ideally positioned in the heart of Surfers Paradise, close to the Surfers Paradise beach and the shopping, restaurants and nightlife entertainment in Cavill Avenue. The 3 towers of the beautiful Moroccan Resort feature style and sophistication in accommodation that epitomises luxury with breathtaking views over the Gold Coast's beautiful Surfers Paradise beaches and pristine waters. The Moroccan GCHR features a wide range of modern amenities and services such as free car parking, guest laundry, fitness equipment, lift, sauna, spa, tour desk, bbq, garden, indoor pool and security. The resort seeks to bring a balance of traditional style and modern comforts to meet the needs of each and every guest. Paros On The Beach offers luxurious 2, 3 & 4 bedroom self contained apartments & penthouse apartments set against the Gold Coasts most beautiful strech of coastline. 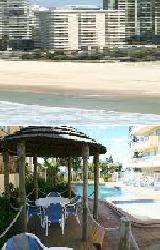 The Paros on the Beach provides all types of travellers with discount accommodation in Surfers Paradise. It also features a wide range of modern amenities and services such as child minding, free car parking, guest laundry, lift, spa, outdoor swimming pool, tennis court, tour desk and bbq. Nearby are some of Australia's most popular attractions such as theme parks, shopping centres, restaurants, golf courses, Conrad Jupiters Casino, Marina Mirage, Pacific Fair, the Gold Coast Convention Centre and much more. Paros On The Beach offers the ultimate beach holiday vacation with its absolute beach front location, excellent apartment accommodation and resort facilities to make your Gold Coast holiday a perfect one. 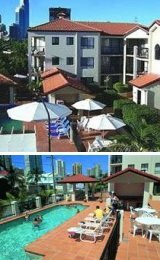 Silverton Holiday Apartments Resort in Surfers Paradise offers budget 1 & 2 bedroom fully self contained serviced apartments with full resort facilities that have breathtaking views in all directions. 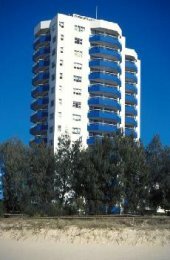 The Silverton Apartments in Surfers Paradise is close to everything that the Gold Coast has to offer, as well as having a numerous guests facilities and services including direct internet access, free onsite secure car parking, gym & fitness equipment, lift, sauna, spa, outdoor swimming pool, tennis court, tour desk, bbq, garden, airport shuttle and baby cots available. When you stay at the Silverton Holiday Apartment Resort in Surfers Paradise you can look forward to a warm and friendly welcome. The Penthouse Apartmentson the Queensland Gold Coast offers guests the choice of 2 & 3 bedroom self contained serviced apartments with direct beach access in the heart of Surfers Paradise. 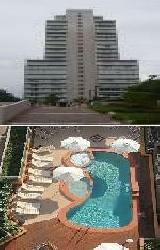 The Penthouses Apartments Resort is a 24 story high rise building that is positioned on the beachfront. 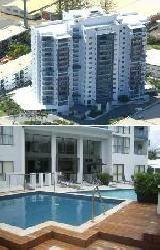 The Penthouse Apartments provides all travellers with affordable accommodation in Surfers Paradise. It also features a wide range of modern amenities and services such as direct internet access, faxing facilities, free car parking, guest laundry, lift, sauna, spa, outdoor swimming pool, tennis court, tour desk, bbq, security, baby cots available and babysitting service. From the moment you arrive at The Penthouses in Surfers Paradise you'll be welcomed into a beachfront world where relaxation and holiday fun is the priority. Grosvenor Beachfront Apartments is ideally situated on the Gold Coast Esplanade directly opposite the Surfers Paradise beach and 50 metres to Cavill Avenue and the exciting heart of Surfers Paradise. The Grosvenor Beachfront Apartments provides both 1 & 2 bedroom fully furnished apartments with large balconies built to take in the magnificent ocean views, a heated swimming pool, spa, sauna, BBQ facilities and a full sized tennis court. Only a short drive from this Surfers Paradise accommodation is the theme parks including Seaworld, Movieworld, Dreamworld and Wet'n'Wild. The Grosvenor Beachfront Apartments will ensure that your next family holiday to the Queensland Gold Coast is a memorable one that won't break your budget. The Chevron Palms Resort is a 4 star modern Mediterranean style low rise building set in a lush tropical landscape setting. The location of this Surfers Paradise accommodation is fantastic, on beautiful Chevron Island in Surfers Paradise, just minutes away from the beach & shops. The Chevron Palms Holiday Apartments provides spacious, open plan i bedroom fully self contained apartment accommodation all with private sunny balconies. Holiday makers can relax by the pool, stroll to the beach or do some shopping whilst staying at the Chevron Palms Apartment Resort. The Chevron Palms is also within easy reach of cruise boats, Marina Mirage, Sea World, championship golf courses, The Arts Centre and Jupiters Casino, as well as major shopping centres and other Gold Coast attractions such as Movie World, Wet'n'Wild and Dreamworld. 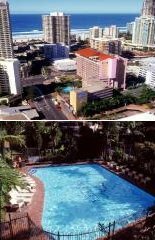 Club Surfers Resort provides budget accommodation in Surfers Paradise, which is right in the heart of the fabulous Queensland Gold Coast. Conveniently positioned between Broadbeach and central Surfers Paradise, the Club Surfers Resort offers great value for money studio style holiday apartments. The Club Surfers Apartments are just minutes away from safe, patrolled Gold Coast beaches, night clubs, casino and restaurants. Guests are within easy reach of the major theme parks at Dreamworld, SeaWorld and MovieWorld plus the other numerous Gold Coast Attractions. Club Surfers Gold Coast offers self-contained studio apartments that are perfectly equipped with all exceptional amenities and overlook the central pool and entertainment area. The Club Surfers Resort Apartments offers fantastic holiday recreational facilities including a spa and sauna, swimming pool, games room, a full size tennis court, a squash court, a barbeque and entertaining area, pool table outside the BBQ area, free secure car parking, free high speed wireless internet and tours desk. The Wharf Boutique Apartments provides spacious, modern and non smoking apartments that are the perfect home away from home on the Queensland Gold Coast. With a range of fully self contained 1 and 2 bedroom serviced apartments available in the heart of Surfers Paradise, the Wharf Boutique Apartments has something for every one. Holiday makers and families can take advantage of all that the Gold Coast has to offer, including fine dining, day spas, nightlife, the fabuolus beach, tourist attractions and action packed theme parks. Positioned just a 2 minute walk to the magnificent patrolled beach and near all the action of Surfers Paradise the Wharf Boutique Apartments has an enviable location but still retains an air of sophistication. The Wharf Boutique Resort also offers an excellent range of guest facilities including a half sized tennis court, heated swimming pool, spa, barbeque, entertaining area, lush tropical gardens, sun deck with outdoor furniture, lift, tour desk, internet access, security system and free secure undercover car parking. 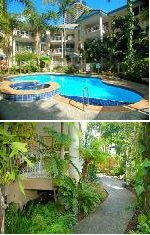 The Mari Court Resort Surfers Paradise is a delightful low rise self catering apartment resort set in lush tropical gardens. This budget Surfers Paradise accommodation resort is ideally positioned midway between Broadbeach and Surfers Paradise and is only 150 metres from a patrolled surf beach. This central Gold Coast location and a range of resort and apartment facilities is what makes the Mari Court Resort Apartemnts the perfect place for a fantastic Gold Coast holiday, that won't break the family budget. 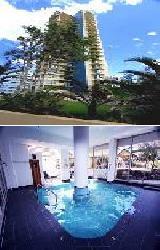 The Suntower Holiday Apartments provides 3 star discount Surfers Paradise accomodation in the heart of Surfers Paradise. The Suntower Holiday Units overlook the world famous Surfers Paradise beach and is ideally positioned on the Indy Car race track. All of these 1 and 2 bedroom Surfers Paradise apartments are fully self contained and feature free Foxtel cable TV, a fully equipped kitchen and laundry facilities. 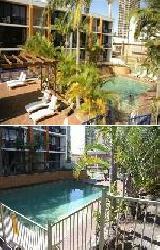 Budget Gold Coast apartment accommodation does not get any better than this. The Artique Resort Apartments on the Gold Coast is ideally situated just one block from the patrolled surf beach and only minutes from the centre of Surfers Paradise with its irresistible dining, shopping and entertainment venues. This central location makes it the perfect Surfers Paradise accommodation for your next relaxing holiday on the Gold Coast. The Artique Resort Apartments reflects the best of Gold Coast coastal living with a range of contemporary 1 and 2 bedroom fully self contained apartments with spectacular, ocean, hinterland or Surfers Paradise views. 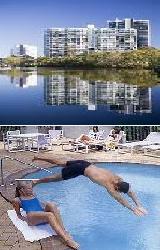 There are also a wide variety of guest facilities at this luxury Gold Coast accommodation including Free security undercover parking, temperature controlled outdoor pool (partially covered), poolside BBQ area, private Theatrette, virtual golf simulation, sauna, steam room, spa, cable TV and tour desk. The Artique Resort Apartments is only 150 metres from the beach and a short drive from the Gold Coast theme parks including Seaworld, Movieworld, Dreamworld and Wet & Wild. 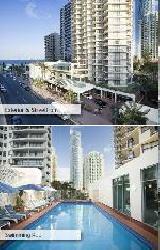 The View Pacific Apartments Surfers Paradise within close proximity to the exciting shops and boutiques on Cavill Avenue. This makes it the ideal Surfers Paradise accommodation to enjoy the cosmopolitan lifestyle promoted by the vast number of cafes, restaurants, bars and nightclubs in Surfers Paradise. Jupiter Casino and Pacific Fair Shopping Center and the famous Gold Coast theme parks are just a short drive from the View Pacific Apartments. There is also a patrolled beach only 50 metres from this Surfers Paradise property and the glamour and excitement that is the Gold Coast is right on your doorstep. Aristocrat Apartments Surfers Paradise is ideally situated in the heart of the Queensland Gold Coast and provides individuals, couples and families with friendly service and excellent value for money Surfers Paradise accommodation. Guests at the Aristocrat Apartments are invited to experience and enjoy the laid back life style of Surfers Paradise with it's golden sandy beaches which stretch for miles, lush oasis setting and breathtaking sunrises over the most beautiful beach in the world. Gold Coast apartment accommodation doesn't get any better than the Hi Surf Luxury Holiday Apartments in Surfers Paradise. 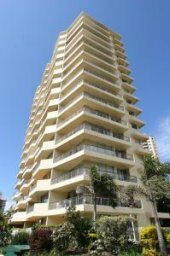 It is a magnificent 28 storey high rise apartment building in the heart of the Gold Coast overlooking the famous, patrolled Surfers Paradise beach. 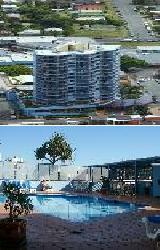 All of the 1 and 2 bedroom apartments at the Hi Surf Apartments Surfers Paradise are extremely spacious and feature ocean views from the large sun drenched balconies, a fully equipped kitchen and laundry, heated indoor and outdoor swimming pools, BBQ area, indoor/outdoor spa pool, sauna, solarium and full size tennis court. As a holiday destination the Paradise Island Resort Surfers Paradise has it all - enjoy all of the tourist attractions that the Gold Coast has to offer, relax by the swimming pool, unwind in the spa and steam room or have a hit of tennis while the kids enjoy the Kids Club. The Paradise Island Apartments is a quality Gold Coast resort located in the heart of Surfers paradise close to the magnificent patrolled surf beach, shopping and restaurants in Cavill Avenue, Gold Coast theme parks and any number of other holiday tourist attractions. The Surfers Paradise accommodation provided by the Surfers Beach Holiday Apartments is exceptional value for money, fully self-contained and ideal for your next family holiday on the Gold Coast. The Gold Coast's only low rise 3 floor walk up 3 bedroom apartments come complete with fully ducted reverse cycle air conditioning, private balcony, ADSL internet connection and 10 channels of Austar cable TV. The Surfers Beach Holiday Apartments are ideally located halfway between Surfers Paradise and the quiet end of Broadbeach and is close to the Convention Centre, Jupiters Casino & Pacific Fair shopping centre, plus everything that the Gold Coast has to offer.